This free guide provides a quick way to identify which cutter bit to use. Pipeline Renewal Technologies Offers New Sewer Rehab Cutter Bit Selection Poster. Pipeline Renewal Technologies has released a new Rehab Cutter Bit Selection poster. It serves as a visual guide for sewer rehab workers to follow when identifying the best cutter bit to use in any given sewer pipeline rehabilitation project. The poster outlines the optimal conditions for each cutter bit, and organizes bits by pipe size, pipe material and cutting task. As rehab contractors know, choosing the right bit increases productivity, generates better results, reduces bit wear, and can spare cutting robots needless extra punishment. 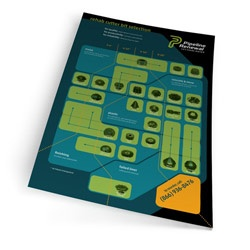 The poster can be found at http://inbound.envirosight.com/cutter_bit_selector_reference_guide and is offered as part of Pipeline Renewal Technologies’ commitment to create and share resources that benefit the pipeline rehabilitation industry. Pipeline Renewal Technologies is an Envirosight company focused exclusively on the pipeline rehabilitation market. The company offers technologies for no-dig structural lateral connection; drain and mainline cutting; durable point repair; video drain flushing; and process measurement. A strong emphasis on support makes Pipeline Renewal Technologies the partner of choice for municipal contractors looking to gain a competitive edge with innovative technologies. Pipeline Renewal Technologies is a member of NASTT and NASSCO.